With the grim news of at least 14 dead in the mudslide that occurred in the state of Washington, I realized that I had never written about mudslide survival. This surprised me, as I, myself, could easily be a victim of one. We’re part-time residents of beautiful Gatlinburg, Tennessee, with a home on a mountain overlooking the town and the Great Smoky Mountains National Park. As such, we live on a slope. How much of a slope? Let’s just say you wouldn’t want to fall off our deck (and not just because of our resident black bear). 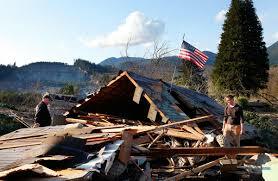 The mudslide in Washington was huge, about a mile wide with an extensive debris field. In some places, the debris is 30 feet thick. Our thanks, by the way, to the emergency personnel who tirelessly dug survivors from the wreckage. 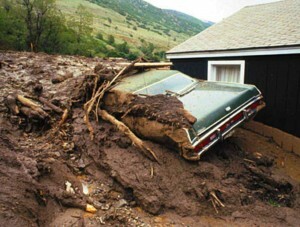 A mudslide, sometimes called a “debris flow”, is a landslide with a high water content. Mudslides act like a river that, if the mud is thick, has the consistency of wet concrete. Mud, rocks, trees, and other large objects are carried along and can cause homes to collapse and a huge amount of traumatic injury to residents. 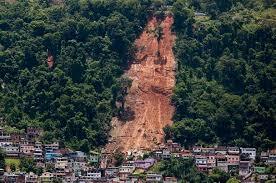 In the U.S., 25-50 deaths occur on average as a result of landslides. Periods of heavy rainfall or snow melt saturate the ground and cause instability in sloping areas. Areas prone to earthquakes, hurricanes, wildfires, and other natural disasters are especially susceptible. Humans contribute to this susceptibility with poor planning: Roads cut into hills and mountains and scenic mountain retreats (like ours!) make mudslides more likely. River or brookside retreats at the base of a hill or mountain (in the “holler”, as we say in Tennessee) are also vulnerable. -Beware of steep slopes, natural or man-made runoff conduits, or eroded areas. -Have the county Geological Survey specialist assess your property for possible mudslide risk. -Consider flexible pipe fittings (installed by pros) less prone to gas or water leaks. -Consider building a retaining wall in likely mudslide channels. -Avoid areas that have experienced mudslides in the past. -Plan out an evacuation route. -Have a battery-powered NOAA weather radio. -Have a medical kit with items to deal with both traumatic injury and water sterilization. -Cracks develop in walls, flooring, paving, driveways, or foundations. -Doors and windows start becoming jammed. -Fences, trees, and utility poles start tilting. -Roads and embankments along slopes start breaking off at the edges. -The Terrain starts to “bulge” or starts slanting at the base of the slope. -Turn on the NOAA radio and listen to warnings as they are reported. -If a mudslide is imminent, get the heck out of there if at all possible with the understanding that roads may be washed out. Stay away from mudslide areas; further mudslides may still occur. -If you stay home, get to the second story if you have one. -Watch for and avoid downed power lines. -As the slide passes through, get under a table and curl into a ball, protecting your head. -If you’re trapped in the mud, survival rates go up if you can form an air pocket around you. You can survive with water for 3-4 days if you had to. Mudslides are just another reason why it’s important to be prepared, in every way, for the slings and arrows that the uncertain future may hold for you and your family.